Hot off the press (and the PDF maker) is the new Secret Fix SF500 brochure, available to download or as a printed hard copy. Secret Fix roofing is a proven product that offers fast, simple installation with excellent performance and design flexibility. There is no need for external penetrations of the outer sheet, end laps or sealant, resulting in excellent durability and a clean, uncluttered finish. Secret Fix roofs are produced predominantly in Colorcoat HPS200 Ultra® pre-finished steel by Tata Steel with the system offering many of the advantages of a true standing seam. When installed as part of an Elite or ElitePlus system Secret Fix and the other component parts combine to provide a complete roof assembly that is guaranteed for 12 and 25 years respectively. The roof systems can be installed with a pitch as low as 1° and can be simply integrated into constructions where the material of choice is steel. 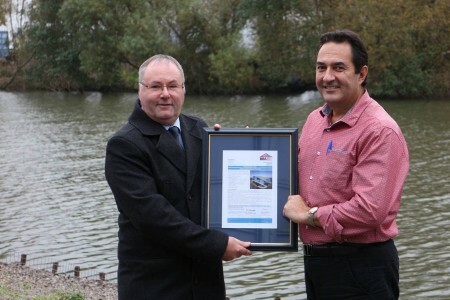 Our Secret Fix roofing was awarded BBA certification in 2004. Building Information Modelling (BIM) is the process of generating and managing data about a building during its lifecycle. 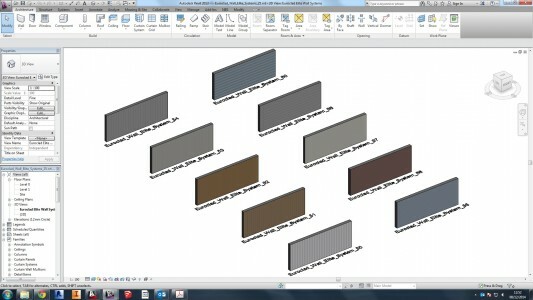 It uses three-dimensional, real-time, dynamic building modelling software to increase productivity in the design and construction stages of a building. The Government’s BIM Strategy Paper calls for the industry to achieve Level 2 BIM by 2016, with Level 3 representing full interoperability and the ulimate goal for BIM. But already there is a great deal of demand for BIM at all levels and pretty soon more than half of the market will expect nothing less than Level 3 interoperability. Currently we can offer BIM Levels 1.5 to 3 and we use the market leading Autodesk Revit for BIM, which allows easy exchange of data between Autodesk suites. We’ve adopted Industry Foundation Class (IFC) and Construction Operations Building information exchange (COBie) principles within our models with embedded Interoperability (Level 3 requirement). We’ve also created our BIM files to be robust and future-proof so that system-wide changes can be made easily, with detailed information behind each system. Even though we’ve come a long way with BIM we will continue to invest in this technology, which will become a standard requirement soon enough. This includes gaining insight into what architects and engineers need, offering focussed support, increasing BIM ready product range and producing details and parametric modelling. One of the advantages of our products is how simple and straightforward they can be to install. Despite this it’s never easy doing something for the first time; especially if you haven’t been shown how to do it. So common sense has prevailed with the production of the first in a range of installation guides that provide guidance through video footage and comprehensive documentation. Vieo is the first to receive this treatment and, whilst training is available, this new installation guide will fill in any gaps that seasoned installers may have, whilst providing a comprehensive education in the installation of Vieo, covering the principles of the roof system and exploring some of the idiosyncrasies that might save you time on site. Our Vieo roofing system has grown in popularity since its launch in 2010. One of the most popular materials that Vieo is supplied in is VieoZinc. Whilst Vieo is the name of our traditional-style, flat-pan roofing system, VieoZinc refers to the material; an aluminium substrate which features a real zinc layer over the top. 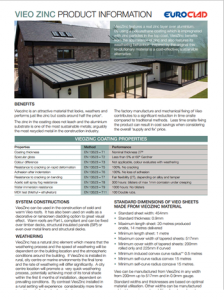 By using a polyurethane coating which is impregnated with zinc particles in the top-coat, VieoZinc benefits from the appearance of zinc and also features its weathering behaviour. Inspired by the original this revolutionary material is a cost-effective, sustainable alternative. For more information on VieoZinc click here to download the VieoZinc product information sheet. The Government Construction Strategy was published by the Cabinet office on 31 May 2011. The report announced the Government’s intention to require collaborative 3D BIM Level 2 (with all project and asset information, documentation and data being electronic) on its projects by 2016. We are way ahead of the curve with our BIM models and will be fully Level 2 BIM ready by the middle of 2014, two years ahead of the government’s target. And if you need BIM files now don’t worry; speak to our technical department and we can help you with the digital information you need. A lofty ambition by the government but one that we share; borne out by our commitment to lead the metal roofing and cladding industry with yet another element of our products and service. CE Marking for Quattro Spacer System is an industry first. Under the Construction Products Regulation (CPR) there is a legal obligation for manufacturers to provide proof of their product’s “fitness for purpose”. To comply with the CPR the Quattro spacer system for built up metal roof and wall cladding is the first product of its kind to be CE marked through the mechanism of achieving a European Technical Approval (ETA). Spacer systems provide the structural anchor for the external sheet of a metal built-up roof or wall construction, whilst creating a cavity between the liner and external sheets to house insulation. Such systems can only be CE marked through an ETA. Roll up, roll up – get your brand new Elite Systems brochure here! We’ve completely revamped our Elite Systems brochure to provide you with the latest Part L-compliant information, presented in an easy to use and attractive format. The publication incorporates the new Quattro bar and bracket system; our self-developed stronger and more cost-effective alternative to existing spacer systems*. Elite Systems provide a package of components from leading manufacturers which combine to form guaranteed roof and wall systems with defined performance. They offer superior, proven roofing and cladding solutions that are easy to specify and offer great performance throughout their lifetime. Elite Systems can be used for a multitude of roof and wall applications, all with inherent design flexibility. Incorporating recyclable, non-combustible insulation cores, they have outstanding acoustic and thermal performance. Elite Systems are reliable, with a standard 12 year system guarantee and the option of an ElitePLUS 25 year system guarantee. 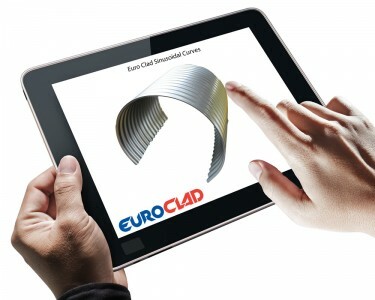 *Comparison based on Eurobar, Eurobar Extra and Eurobar Extra Mast systems previously available from Euroclad. 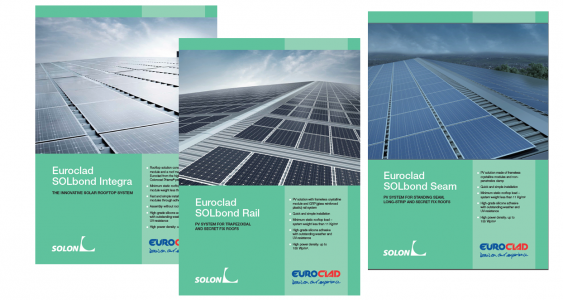 New SOLbond – PV Technical brochures. Euroclad SOLbond INTEGRA -THE INNOVATIVE SOLAR ROOFTOP SYSTEM.Rooftop solution consisting of a PV module and a roof manufactured by Euroclad from the high performing Colorcoat Prisma® pre-finished steel. 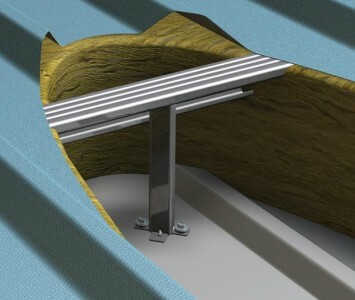 Euroclad SOLbond RAIL – PV SYSTEM FOR TRAPEZOIDAL AND SECRET FIX ROOFS. PV solution with frameless crystalline module and GRP (glass reinforced plastic) rail system. 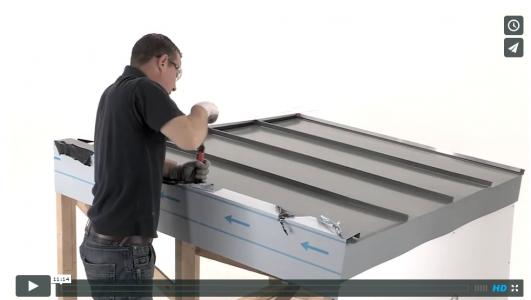 Euroclad SOLbond Seam - PV SYSTEM FOR STANDING SEAM, LONG-STRIP AND SECRET FIX ROOFS. PV solution made of frameless crystalline modules and nonpenetrative clamp.